Graphic design usually is a two parts trade, someone design something, someone print it. It will not be true in maybe 10 years from now, and we already see much of the graphic design to take place online or in digital devices, but printing will always be part of graphic design. While many printing techniques are obsolete, they are still around in a more artistic form, like silkscreen and… letterpress! 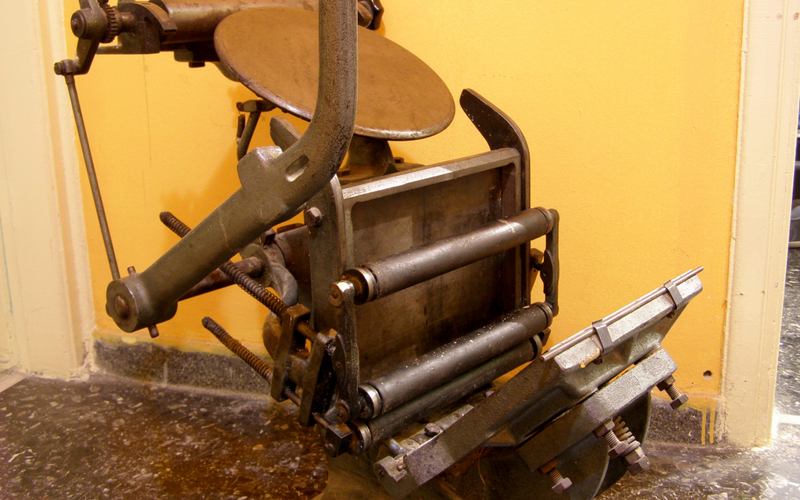 You will see a lot of letterpress machines around like adast grafopress and Heidelberg windmills, but they are mostly used for die cutting for packaging, special envelopes etc. Some printshops use them for embedding letters or graphics on thick papers, while there are some custom made machines that can do foil printing. So back in 1900 they had some small (but heavy as hell, need 3 adults to move it) tabletop letterpress machines, which does not have automatic paper feed (you add the paper, you print, you remove it) and they move by hand. 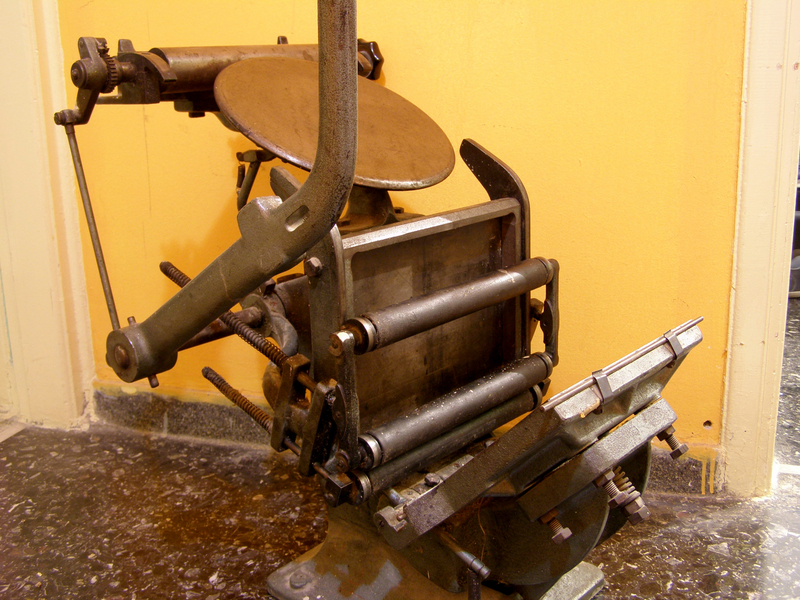 Those machines are still made today by Caslon, a company who bought Adana (a long time letterpress maker) and they still make new machines and provide letterpress supplies. While this is cool they cost the same as getting a used adast grafopress windmill, so it is not very affordable way to enter letterpress. They are however way easier to operate. What other options are there then? Old machines, that you can get for almost the price of scrap metal, and if you are lucky like me you can find them in full operational condition. Meet the Hohner Hobo II, a tabletop letterpress with automatic plate inking but unfortunately without the automatic paper ejection. Also while I got one of the small tables it have, the part that hold it in front of the machine is gone. No big lose, I will make a custom made table to hold the whole machine and I can add a small extension to where the small table should be in front of the machine. What else it needs? The ink rollers seem to be in good condition, but they have some hits here and there, which may (or may not) leave marks in printing, but there are places where you can change the old rubber with new for a small price. Also I don’t have any lead spaces and the tighteners that keep in place what you want to print, and I don’t have yet any letters to use. While I can get them new, I need to have the shipped from UK and will cost a little extra. My best bet is to find old printshops that go or already are out of business and get some. The big question is what I will do with that machine? It is simple, there are projects like business cards and wedding invitations that require letterpress print, many people love the impression it left on paper and you can do it with or without ink and with custom plates with something you designed in your computer (but you need to avoid fine details that will be lost). Now you may wonder who is gonna do that work manually when there are the machines mentioned above, that do it almost unattended but the answer is simple. The cost to get this for small quantities plus the shipping (local printshops are not an option, they cost even more) can evaporate any possible profit you can make from a project that require letterpress but it is like 100 cards. So you can do it with that machine and under the right conditions even sell it for handmade, because in the end it will be printed by hand, one by one! I look forward to use this machine and share my creatings!